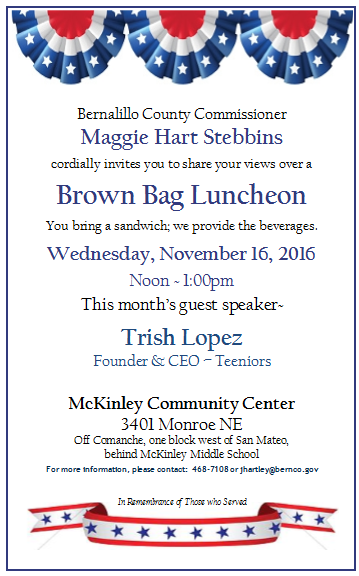 I’d like to invite you to my next monthly neighborhood luncheon on Wednesday, November 16th, noon-1:00pm, at the McKinley Community Center,3401 Monroe NE. This month’s speaker is Trish Lopez, Founder and CEO of Teeniors, an Albuquerque startup that matches tech-savvy teen with seniors who need help with their smartphones and other electronic devices. Trish has a 13-year professional background in the film industry and has worked with everyone from Hollywood executives to political leaders. After returning to New Mexico, she founded Teeniors℠. Teeniors has assisted more than 300 seniors in the Albuquerque metro area and in Santa Fe. Dozens of teens have participated, earning $15.00 an hour for each session organized by Teeniors. It has received multiple new business awards, completed the ABQid accelerator and earned continuous 5-star reviews from clients. Most recently, Trish has been named the youngest inductee into the Silver Horizon’s Hall of Fame. A native New Mexican, global traveler and graduate of UNM, Lopez is deeply involved in social causes, having led and served on the boards of several national and local organizations. She is currently an alternate on the Bernalillo County Code of Conduct Board. Bring your smartphone, tablet or laptop (maybe, even your car’s infotainment system) and receive one on one, personal coaching after the Luncheon. This is a Brown Bag lunch. You bring a sandwich and we will provide the beverages. An RSVP to jhartley@bernco.gov is appreciated but not required. Please feel free to share with your friends, neighbors and association memberships. I look forward to seeing you on November 16th!